It takes vision to imagine a cow paddock on Melbourne’s western fringe being transformed into a $150 million soccer stadium surrounded by a commercial property precinct within five years. But it is a plan that several Melbourne billionaire individuals and families have backed, and a dream that now has to come true after the Western Melbourne Group consortium was awarded an A-League soccer expansion licence this week. 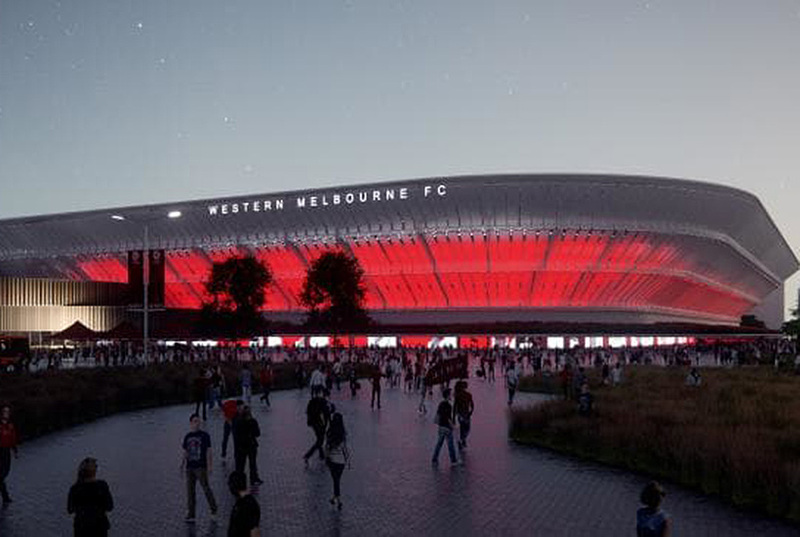 WMG will build a 15,000-seat soccer specific stadium for their team at Tarneit, about 30km west of Melbourne’s CBD, which will be paid for by a cashed-up consortium who will use income from a residential housing precinct and a mixed-use commercial property development to underpin the entire project, with the assistance and backing of the local Wyndham council. The plans are ambitious — and it is understood Football Federation Australia has required plenty of contractual checks and balances to ensure the club delivers on its promises — but it stands to be a game changer for Australian sport. What it entails is sport becoming part of a wider property investment play. The stadium acts as a centrepiece of a project that also generates other revenue and is an alternative to the traditional Australian sporting model of governments building and owning stadiums. It also comes at a time when Sydney is embroiled in controversy over the funding of $2 billion worth of stadium rebuilds by the NSW government, which may be at risk if the Labor opposition is elected. WMG will own its own stadium and therefore control all the revenue streams from ticketing, corporate box and food and drink sales, joining the AFL at Marvel Stadium in Melbourne’s Docklands as the only stadium owners at the top level of sports. WSG and its backers will also make money from surrounding property to underpin the stadium, creating jobs and economic activity in the process. “It is a unique project in Australia but something that is quite common in sport around the world, particularly in America,” WMG bid team member Maurice Bisetto, a KMPG partner, tells The Weekend Australian. “The plan is to have a precinct that is a destination and with a stadium at the centre of it. WMG plans to begin construction on the stadium by about this time next year, having struck a deal with the council to gain access for the land. Driving the deal has been Kate Roffey, an experienced sports and business executive appointed by Wyndham City Council to chase deals that will act as catalysts for economic growth in the region. WMG’s team will play at Geelong’s Kardinia Park for at least two, and potentially three, seasons before it moves in to its venue. By then, residential property developments would have already been underway to help pay for the stadium, though investors — understood to be billionaires with shopping centre, hotel and investment experience — will stump up the majority to begin with. Once the stadium is built, a precinct will emerge that could include a hotel, office blocks and community buildings, though the mixture is still to be negotiated with council. A new railway station nearby is also planned, with a town centre developed by the council planned for the other side of the tracks. WMG’s investors could emerge with ownership of assets worth tens or hundreds of millions more than their initial investment. It could make annual profits and investors could later sell their stakes for capital gains. It is hoped the entire project will be built within about six years. Property also underpins the other new team set to join the A-League, Macarthur South-West Sydney. The club, which will enter a year after WMG in the 2020-21 season, is 50% owned by billionaire Lang Walker and will play at an already built stadium in Campbelltown. The owner of Walker Corporation sees the soccer team as helping build an asset in a community in which he has big investments in. Walker also says his expertise will be used by the local council to help rejuvenate the area around the existing stadium, and the building of a “centre of excellence” training centre for the new club.